Countdown the days until Christmas at Thrills Casino and win yourself a daily prize with their Xmas Advent Calendar. Up until January 3, 2016, players can log in and click on the Christmas calendar to open their gift for the day. Prizes range from free spins, cash bonuses and more when you make a deposit. Today’s bonus: Up to $40 matched by 400%. For example, if you deposit $10 and opt in for the bonus (this needs to be selected) you will receive $50 to play with. Log in each day to open up a new prize – but remember the site runs on CET time so be sure to look up time differences. There is a countdown available until the next bonus is available to be opened, so you can rely on this. It should be noted prizes for players are linked to the Bonus-O-Metre, so we recommend playing as much as you can to earn the points and in turn receive better rewards. There are an array of new titles available at Thrills online casino so you can use your bonus on these games or earn better rewards by playing them. 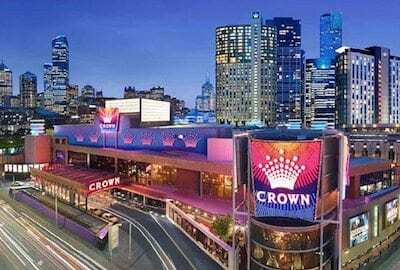 The latest releases from Net Entertainment include two Christmas themed slots – revamps of existing pokies – to get you into the festive spirit. The 5 reel and 30 payline Spring themed slot has been transformed into a wintery wonderland perfect for a White Christmas. The flower symbols we are use to seeing so bright have been snowed on and the edge of the reels have been decorated with baubles, stars, and more. Even the lower A to J symbols have been transformed into gingerbread. 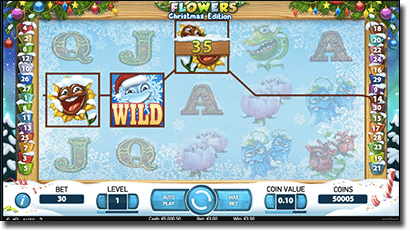 But this is where the differences stop as gameplay is exactly the same as the original Flowers pokie, including up to 30 free spins with up to a 10x multiplier – triggered by landing eight Scatters – available to win. Eight may seem a lot but when Double symbols – two symbols in one – have been added to the reels it is quite easy. For example, if you spin a single Scatter on reel 1 and 2, but a double Scatter on reel 3 you have scored four Scatters here. Flowers: Christmas Edition is available on both desktop and mobile devices. As with Flowers, Fruit Shop is a slot available already but the Christmas version has been re-decorated and transformed into a winter wonderland. There’s even a big snowman and a beautiful Christmas tree on the side of the reels to keep you company as you spin the 5 reel and 15 payline slot. The symbols have been frozen and are set on a backdrop of a crisp, starry night, but once again this is where the differences cease between the original and the Christmas Edition. 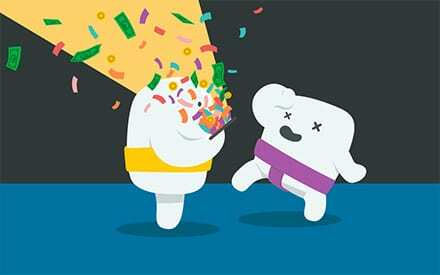 There is a Free Spins feature which can be continuously activated and every win is doubled. If you happen to spin a Wild here too, all wins are quadrupled. Fruit Shop: Christmas Edition is also available on smartphones, tablets, laptops, and desktops. These slots, while already available with a different theme, will definitely get you in the mood for Christmas and are perfect to fill the Bonus-O-Metre and earn better rewards in the Xmas Advent Calendar. If you aren’t a member of www.Thrills.com yet, follow our links to sign up safely and open your prize for the day. For more festive cheer, get in on the action at Leo Vegas Casino with the chance to win a share of $100,000 in cash and prizes this Christmas season.